Hundreds of homes and buildings are open to the public this year as part of the Open House scheme so choosing which ones to visit is going to be tricky. But if you are a budding self-builder or just desperately trying to find a slither of land in London on which to build yourself a pad, a new carefully crafted development in South London could prove a heartening experience. Award-winning architects Robert Barker, director of Baca Architects, and his wife Jessica Lawrence are in the process of building three cool and innovative new homes on a constrained triangular-shaped plot in Forest Hill. The site provides an opportunity to see how architects build their own homes and, as the houses are not quite finished, a real insight into the practical workings of what’s required to create a modern low-energy house on a budget. The canny development is well underway, building works started in summer 2012, and the site will be open on Saturday 21st and Sunday 22nd September enabling other self-builders to see how, with clever design and spatial planning, it’s possible to work every inch of a tight site and create a spacious urban oasis in the process. 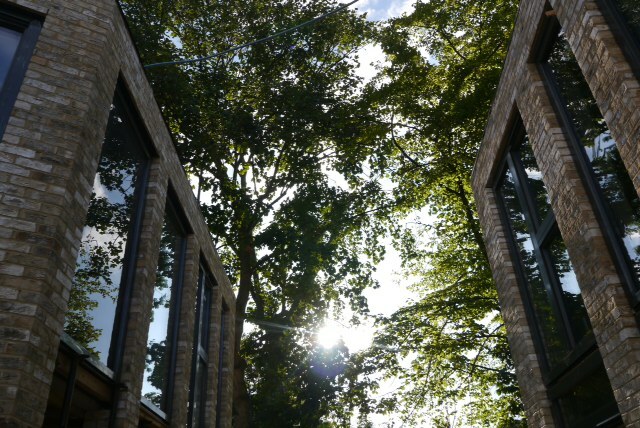 Unfazed by having to contend with 32 party walls, the couple has redeveloped the dilapidated buildings on the SE23 site to create three bespoke homes – loaded with green eco features – in a smart mews development surrounded by traditional Victorian stock. Built around a shared central courtyard, each of the properties also has its own private courtyard set between the living and work spaces. These courtyards form an open plan configuration, with glazed doors allowing views from one space to the other. The flexible arrangement means the space can be used as either an extension to the living area or to the workspace as desired. All of the houses has a green roof and will shortly be clad with striking greenery to the walls; with a variety of plants trained to a geometric pattern creating a slice of the country in the midst of South East London. The vertical gardens were inspired by views from the property of ivy clinging to the trees in winter and, with a mix of deciduous, evergreens and flowering plants, have been designed to create variety throughout the year.